Drawing on the right is one of many step by step assembly drawings supplied with our boat kits. Note how the kit parts are numbered to correspond with the drawings for easy assembly. OK II 9 is based on the OK Racing Runabout, with a raised covered front deck, windshield and combination outboard engine cover and seat fairing to give this model a sporty mini speedster look. This is a boat that will give the amateur boatbuilder no trouble in completing. The plans are fully detailed and include full size patterns of frames and transom. OK II is an extremely sharp looking little craft with top performance. 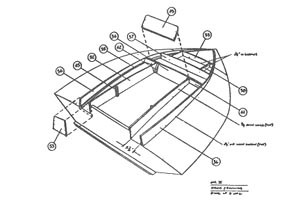 Complete boat kits include all mahogany frame members and mahogany longitudinal members, such as keels, chines, sheers, spray rails, etc; 1/4" marine plywood deck, side and bottom panels; mahogany reinforced marine plywood transom and girders and many other parts. Sport runabout also includes the custom windshield, raised decking and combination seat fairing and outboard motor cover. Bronze fasteners, glue, and step by step instructions are all furnished. 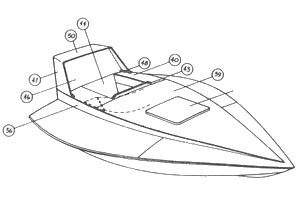 OK II 9 is a modified version of the OK 9 Hal Kelly boat plan design. Plans & Patterns Only $19, Was $39.